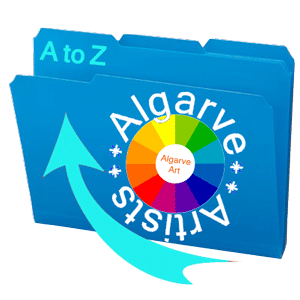 A Great Artwork Inventory with an exclusive Algarve Society of Artists Members Discount offer. A Personal Review by Alyson Sheldrake. As a professional – and busy – artist, I know the value in being organised and keeping track of all of my art work. I cannot believe that I only set out on this journey as a professional artist less than six years ago, and already I have painted over 200 paintings – of which, to date, I have the grand total of three unsold paintings sat in my studio. Yes – just three! Which does mean that I have a very large record of paintings that have now sold and gone to their new homes – all around the world. For ages I tried to keep track of all of my sales via a home-made Excel document, cutting and pasting a picture of each painting next to an ever widening list of ‘important information’ that I needed to keep and refer back to. And then I found I needed an address book, just to keep track of all of my clients, and then another address book as the first one rapidly filled up with certain letters of the alphabet! Lots of people with the surname ‘T’ wanted to buy my paintings for some reason. And then I began compiling paperwork for our own ‘Pop-Up’ Art and Photography Exhibitions that we organised around the Algarve with my photographer husband, and realised that my ‘system’ just wasn’t robust enough for my needs. I searched online and I have to be honest, I found the Artwork Archive online art inventory management system and thought ‘Wow! that’s perfect!’ Then I looked at the price and I did think ‘ouch’ … and filed it away for the future as a ‘one day’ purchase. But the months went by and my Excel system started collapsing under the weight of all the information I wanted to save – but then found impossible to search through, and I found myself constantly scrolling up and down the columns to find the painting I needed to refer to. A client would call me and ask for a second painting to be commissioned to ‘match the first one’ and I would gamely battle through the conversation thinking ‘I should know which painting they are talking about’ … Often I couldn’t remember the name of the painting let alone what size it was! So back to the internet I went to search for a better solution – and the Artwork Archive came up trumps over and over again, with excellent reviews and ratings. I was also lucky enough to find a contact which gave me a lifetime 20% discount on the Professional Package I had earmarked .. it should be $9 per month, and the discount just made it seem that bit more affordable – so I clicked on the Free 30 day trial and within an hour I had uploaded over 20 of my paintings and I was hooked! It was a very easy system to navigate and use. I decided to start right back at the beginning of my paintings from 2011 using the numbering system consecutively, and by the second day when I clicked on my account, I had already decided to activate my account and pay for the year up front. I couldn’t imagine not having the programme – after only one day! It took me about a week, when I had an hour or two free on the computer, to upload all of my paintings in order. It was an amazingly satisfying feeling seeing them all there in my account – and live on my ‘Public Page’ too, and knowing that all of the high res images I had uploaded were all safely stored on the programme’s cloud too. They recommend you upload your best resolution images, safe in the knowledge that they re-size them for the web, but if you ever need to download your originals, they are all there securely stored too. My next challenge was transferring all of my customer and client information across too. My husband and I write a popular monthly newsletter which we send out electronically to our subscribers via Mailchimp, so being able to cross-reference confidential client information is going to be brilliant. It was also amazing to see how many ‘repeat customers’ I have actually had and to see where in the world all of my paintings have landed. Marking a painting as Sold! in the programme is just the beginning. I can now create a Certificate of Authenticity and sales paperwork including an invoice at the click of a button, rather than copying and pasting everything through Word. If I am sending paintings to a gallery or exhibition in the future, I can just create a Location, assign the works that are going there, and then click to create a Consignment Sheet, with all the information about each work displayed. Labels and Portfolios are there ready to be compiled and printed out. The Insights section allows me to view a full inventory of my production and sales, location of works and values – all via nice pie charts and bar charts. There are more sections that I have not really explored yet, including a schedule and task lists that will come into their own as soon as we start planning another exhibition. They also have a Blog with excellent art advice and articles, which you can access here along with an FAQ Help section to steer you through the system. The exciting news is that members of the Algarve Society of Artists can receive a lifetime 20% discount on their subscription – thank you Artwork Archive for supporting us in this way. If you are not a member – why not join us today? Membership costs only 15€ a year and entitles you to a range of benefits – not least the discount on Artwork Archive! Click here to find out more. Being an artist today is much more than just being able to create great art. You need to have a business head on your shoulders – at least for a part of each day – if you want to sell – and keep moving on .. and growing as an artist. Finding a package that helps me to do all of the admin that I know I need to do – and a whole lot more on top – has been brilliant. It has helped me to ‘professionalise’ my work – both literally – and also – more importantly maybe – in my head too. I am proud to call myself a professional artist – and I am really pleased to have found an online tool that helps me to control all of my workflow and create an ongoing and growing inventory of my work. And I am delighted to be able to genuinely promote this product to you – and to be able to offer the excellent 20% lifetime discount to our members too. Thank you Artwork Archive. I had better get back into the studio now and get painting again!